I'm pretty sure that those rippers are still somewhere in one of my hobby boxes and if I find them again I will make sure to post up a picture of them. However, they do not form part of my photo shoot for today. It's only a small force to begin with, as I dip my toe back into the Tyranid range, but it will hopefully form a nice core to the army. At the back I have one of the old Hive Tyrant models, without wings, so I think he will have to form up with some warriors for a hard hitting close combat unit. I also have 20 Gargoyles (but only 10 built) as I wanted to include the Skyblight formation in my army if I can get all the models together. As you can see in the picture above there is also a Zoanthrope, which I will have to learn to use as I have never really used psykers in my 40k armies before (too many games with my Necrons clearly!). I'm pretty sure I have another couple of metal Zoeys somewhere and they will form a nasty brotherhood of psykers I feel. On the left hand side I have a Tervigon and some Termagaunts. These will form the backbone of any swarms I build. Individually they may not hit hard but I'm hoping sheer weight of numbers should overwhelm most units. 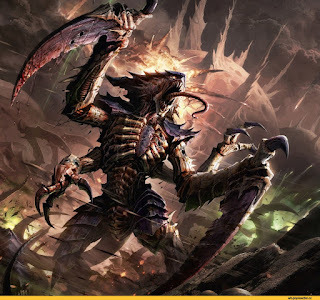 The Tervigon model is really cool and I love the Termagaunt model spawning from it's belly in true Alien style (without the whole killing it's host thing, because Tyranids are just that much tougher than puny humans). All that is left to do now is decide a colour scheme and get them painted and ready for the the tabletop! Why not leave a comment below and let us know what you are working on as well? Who knows, your project could feature in our next WIP Wednesday!